From Katfriend Anna Maria Stein comes a report of a truly fun event, though it has a thoroughly serious dimension to it. This event, hosted in the Triennale Museum, Milan, was a mock trial of one of the most renowned creations by the Italian Chef Gualtiero Marchesi -- a risotto called “Riso oro e zafferano” (rice, gold and saffron: you can watch the maestro making it on YouTube here). Three judges presided: Marina Tavassi (President of the Company Division of the Court of Milan), Roberto Magnaghi (General Manager, Ente Nazionale Risi, the Italian Supervisory Board for Rice) and Anna Maria Stein herself, acting as Instructing Judge to introduce the matter to the audience. World-famous Chef Gualtiero Marchesi opened several restaurants over the years. Many people have worked under his supervision and some of his most talented assistants managed to become famous chefs themselves. Among them, there is Guido Rossi [you won't find him in any of the Good Food Guides: he doesn't really exist ...], who worked along Chef Marchesi and had the opportunity to learn the recipes directly from the author. Cooperation between Rossi and Marchesi (left) ended following a discussion between them, and Rossi decided to open a restaurant on his own -- “All’ultimo risotto”. There the chef serves a dish that reproduces “Riso, oro e zafferano” under the name “Risotto oro e zafferano, omaggio a Marchesi” ("Rice, Gold and Saffron, A tribute to Marchesi"). The only difference lies in the type of rice used (Carnaroli in Marchesi’s risotto and Basmati for Rossi). The Basmati rice, though of good quality, is not suitable for risotto; moreover the Basmati used by Rossi of poor quality. The price of the dishis quoted as being the same as at Gualtiero Marchesi’s restaurant. 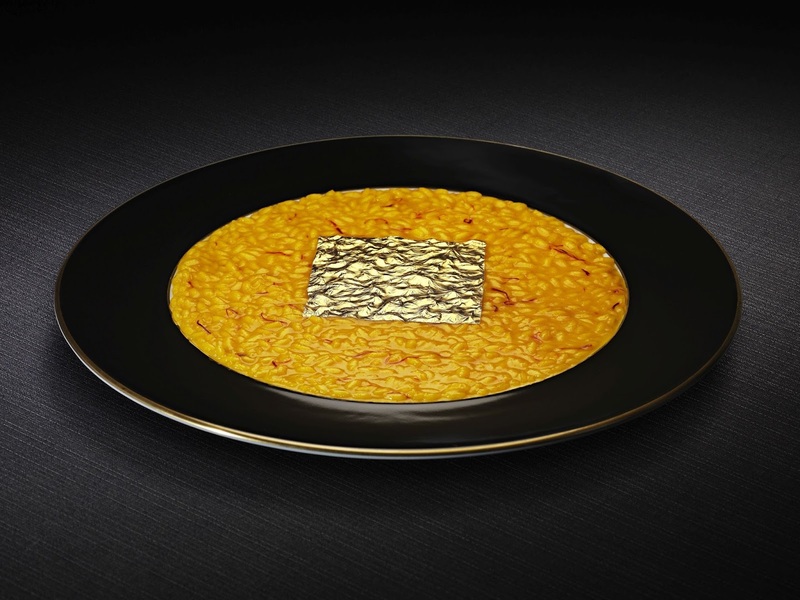 Marchesi, who holds a trade mark registration for the image of his risotto as well as a design registration, considers that his “dish” is also protected by copyright. His recipe has been published in books and magazines all over the world, and not only in relation to cuisine and restaurants. Accordingly Marchesi commences proceedings before Rossi before the Court of Milan. The Instructing Judge appointed a Court Technical Expert, Cinzia Simonelli (Italian Supervisory Board for Rice), whose technical report explains that the rice used by Rossi does not have all the technical qualities for a good risotto and does not meet the minimum quality standards set by the Italian Law (being a rice of a very poor quality). Following the submission of this report, the lawyers of the parties -- Professor Mario Franzosi (for Marchesi) and Cristiano Bacchini (for Rossi) -- were invited to discuss the case before the Court. Discussion focused on the identification of the relevant consumer for trade marks and of the informed user for design. Some members of the public were involved by the two lawyers in support of their respective submissions. During the discussion, two chefs were cooking the original dish as well the allegedly infringing dish for the benefit of the Court and the public, following which the Court rendered its decision. (5) transmitted the file to the Criminal Public Prosecutor. Gilberto Cavagna (Legal Affairs Department, Expo Milano 2015 SpA) provided a short overview on infringement cases related to Expo’s trade marks during the Exposition. Luca Ponti, a criminal lawyer, discussed the possible criminal aspects of the present case. Marina Lanfranconi and Elisabetta Mina, lawyers, provided an overview of the international situation in relation to the protection of “taste and smell” and copyright relating to food dishes. Natalia Bobba provided with an explanation of the visual and smelling test of rice. Anti-counterfeiting organisation Indicam provided a short overview of its activity to protect Italian food. I can only agree with the Court on one point: how the hell can you cook a risotto with Basmati rice? ?